Toshiba laptops have come a long way in recent years, inspiring brand loyalty in more than a few customers. 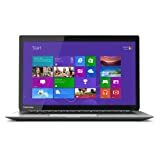 These days, Toshiba provides quality laptops at reasonable prices. But with many models to choose from, how does a loyal Toshiba user choose their next upgrade? How does a newcomer decide which of the many models will best meet their needs? We’re here to answer that question for you. We’ve gathered feedback from Toshiba users around the globe and analyzed it to find the most important criteria for choosing a Toshiba laptop. After careful consideration and comparison of many different Toshiba laptops, we’ve narrowed the competition down to bring you our list of Top 5 Best Toshiba Laptops on the market today. There’s a lot to consider when choosing a good laptop. Even working within one brand, deciding which features are important is highly dependent on what you, as an individual, plan to use your laptop for. We determined this final list by taking a look at what users reported as the most important features of a Toshiba laptop. Some users may need more or less processing power depending on intended use, from gaming to simple web browsing. There is also a lot of variety in how good your laptop’s graphics card needs to be, and in how important portability is. However, one feature that is important to most users is the display. We’ve focused in on the display as the biggest consideration because it’s a feature that remains important across many different use cases. Display, however, is important in almost every use case. Low-quality displays lead to a poor viewing experience at best and an outright inability to run one’s applications at worst. Bad displays can also lead to eye fatigue and headaches. Your display needs will vary according to your purpose. Higher resolution screens can be (but are not necessarily) more expensive and vary according to the model and size of the laptop. Generally, the larger your laptop screen the more important resolution becomes. A second important consideration for Toshiba users is processing power. A good CPU is integral to how fast and how well your machine runs. However, CPUs get more and more expensive as their quality goes up. On the one hand, if budget is a consideration you’ll want to think carefully before springing for the fastest CPU on the market. On the other, you may not be able to avoid forking out for a good CPU if you plan to use your laptop for heavier applications such as gaming or Photoshop. The Intel i7 series processors are some of the best, fastest, and most reliable CPUs out there. If you’re a high-demand user, you’ll definitely want to think about getting a laptop with one of these. Luckily, they’re not unreasonably expensive. They will bump up the price of your laptop, but you definitely get what you pay for—there’s no cost inflation here that we can detect. Even if you don’t need quite that much processing power, we recommend going with a minimum of an Intel i5 processor. These processors are powerful in their own right, and they’ll keep you moving smoothly through a number of use scenarios. In addition to making sure you have a good CPU, you’ll want to make sure your laptop has enough RAM. RAM is the working memory of your device. Too little, and you won’t get the most out of that lovely CPU you paid extra for. Just as choosing a CPU depends on what you need it for, so to does choosing a specific amount of RAM. More RAM means more money, so if you’re on a budget you probably don’t want to buy more than you need. On the other hand, it’s no fun to realize that you needed more than you thought you did and end up either stuck with less-than-ideal speeds or stuck purchasing additional memory. We recommend that you think carefully about what you will ultimately be using your laptop for, both in the near future and over the life of the machine. If all you need it for now is to run a word processor and check your email, than 4GB will be fine. On the other hand, if you’ve had it in the back of your mind that you’d like to get into graphics design or try out that favourite RPG of your cousin’s, you might want to go higher so that you’re prepared when that day comes. Hard drives = storage space, and while it’s entirely possible (and common) to supplement with an external storage device, it’s also important to have sufficient space on your laptop itself. However, space isn’t the only consideration when it comes to choosing a hard drive. You’ll also want to keep in mind whether your Toshiba laptop offers a HDD (hard disk drive) or SSD (solid-state drive). Each comes with its pros and cons. If funds are limited and you need lots of storage space, you’ll be better off with a HDD as they tend to come in larger sizes at a cheaper cost. On the other hand, read-write speeds are improved by the often smaller and more expensive SSDs. We recommend starting with not less than 500 GB HDD or 128 GB SSD and going up from there, depending on your needs. Portability is a feature important to laptop users of any brand. As our lives become increasingly mobilized, being able to take your laptop with you and use it on the go becomes a vital factor in choosing a device. Several factors go into portability, including size, weight, and battery life. Which of these factors is the most important to you depends on what you’re willing to sacrifice. A lightweight laptop means less hardware, a slimmer laptop means giving up a disc drive, and a long battery life can sometimes mean sticking with lighter applications. We recommend looking for a good balance between these three factors, keeping in mind the overall needs that you have for your laptop and the area of convenience that is most important to you. Our #1 pick for best Toshiba laptop is the Toshiba Satellite Radius 2-in-1 . Laptops that can be converted into tablets are all the rage it seems, but sometimes the end product doesn’t live up to the hype. That isn’t the case with the Radius. 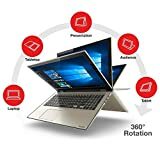 This laptop can be adapted to laptop, table top, presentation, audience, and tablet uses, and performs nicely in all five modes. The Radius offers a beautiful 4K Ultra HD display at 3840 x 2160 pixels. Some might consider this overkill on a screen size of just 12.5,” but you certainly won’t suffer for lack of sufficient resolution. This screen has quite excellent colour quality as well. In addition to a fantastic display, the Radius also does well in the processing power department, particularly for a laptop of its size. This device supports your computing needs with an Intel i7 CPU and 8GB of RAM. It also offers a 512 GB SSD for a decent amount of storage and faster read-write speeds. The Satellite has a lot to offer in terms of portability. With a battery of life of up to seven hours, you’ll be able to get in plenty of work before you need to recharge. The Radius weighs in at just under three pounds and is just 0.61” slim. With that beautiful 12.5” screen, this laptop is a great choice for those looking for a highly useable, highly portable laptop. The Toshiba Kirabook landed in second place as our #1 Top Pick for best Toshiba laptop. The Kirabook is another excellent choice. With a 13.3” screen and 2560 x 1440 pixels, this laptop is small enough to be highly portable while still giving you a great viewing experience. The Kirabook offers high-quality processing power with another i7 CPU and 8 GB RAM. While this probably won’t be enough RAM for high-powered gaming, it will be more than sufficient for most other purposes. The 256 GB SSD on this laptop is another great feature, at twice our minimum recommendation. Portability holds up as well, with a superb battery life of up to 9 hours for all-day use. The Kirabook adds just three pounds to your bag and is 0.7” slim. Like the Toshiba Satellite Radius, the Kirabook has a beautiful display, great processing power, and an excellent portability profile. However, this laptop has just a 256 GB SSD compared to the Radius’ 512 GB SSD. For that reason, it slipped into second place. For those who prefer a larger screen, next on our list is the Toshiba Satellite S75. Coming in at third place, this laptop comes with a 17.3” Full HD display at 1920 x 1080 pixels. In addition to a great display, the Satellite S75 also offers excellent processing power with an i7 CPU. The RAM is 4x our minimum recommendation for Toshiba laptops, at 16 GB. With an SSD of 256 GB, this device has a lot to offer in terms of speed. The portability of this laptop is quite good, particularly for a device of this screen size. The battery on the S75 lasts up to six hours. At 5.9 lbs it’s quite a bit heavier than our first two picks, but not unreasonably heavy. It clocks in at just under an inch thin. Ultimately, this laptop came in third due to lower screen resolution and less portability. However, with it’s still a fantastic pick amongst Toshiba laptops, particularly if you need more processing power. Close on the heels of the Satellite S75 is the Toshiba Fusion. The Fusion is the second 2-in-1 on our list, combining some great features with a middle-of-the-road screen size of 15.6” for those aren’t willing to sacrifice either portability or viewing area. This laptop has a lovely Full HD display. Like the S75, the Fusion runs smoothly with an i7 processor, 8 GB of RAM and a 256 GB SSD. When it comes to portability, the Fusion maintains excellent battery life at up to eight hours. It’s runs 5.1 lbs to the Satellite S75’s 5.9, making it lighter than our number three pick but heavier than the top two laptops on our list. Like all of our contenders, the Fusion is under an inch slim. The Toshiba Fusion is a great choice for those who would like a larger laptop with good processing power and battery life. Last on our list is the Toshiba Satellite C55. Although this laptop placed fifth, it still beat out many other Toshiba laptops to land a spot on our Top 5 list, and it’s more than earned its place. The 15.6” C55 is a great choice for those on a budget. This laptop that runs at excellent speeds, with an i7 processor and 8 GB of RAM. It also has a 1 TB HDD for those with extended storage needs. Portability is nothing to laugh at on this model either. While the six-hour battery life is on the low side for our top picks, it’s still enough to get plenty of work done in one sitting. The C55 weighs in close to our number four pick at 5.2 lbs, and remains slim at 0.9”. In the end, the Satellite C55 came in last merely because it has a HD display, compared the to the Full HD and above offered by our other picks. However, if you primarily use your laptop for daily activities such as web surfing, document creation, and movie streaming, this device will meet your needs at a reduced price. After a careful comparison against many other Toshiba laptops, the Toshiba Satellite Radius 2-in-1 flew into first place as our #1 Top Pick. The Radius won out because of its superior combination of highly efficient processing power, gorgeous display, and excellent portability. Although the Satellite Radius placed first on our list, the other four laptops to make the top five are also well worth your consideration. Each has something special to offer, from screen size to processing power to portability. Depending upon your unique needs, you may find that one of these four laptops is the Toshiba best suited to your needs. We looked at a number of Toshiba laptops before we named one the Best Toshiba Laptop of 2016. In this review we look at five possible winners.